To celebrate their 25th anniversary Mission launched the 750 Limited Edition bookshelf speakers. Only 7000 pairs of this little gorgeous sculpture are being made, and then it's over. 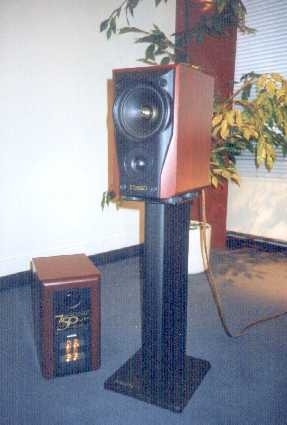 The 750 is an entirely new speaker, based on no older Missions. It comes as a tiny but weighty 2-way model, clad in lush real rosewood or black ash veneer, and looking not unlike a Sonus Faber Extrema (after all this is an Italian magazine, so I have to honour my host, comprende?). The driver compliment is made up of a 13cm Aerogel woofer, and a silk dome tweeter (as in the other Mission 75-series speakers). The bi-wiring binding posts are heavily gold-plated, and there is a reflex port at the back, which precludes use close to a wall. Sensitivity is 86dB/W@1m, and the nominal impedance is 6 Ohms, not hard to drive. The 750s look very attractive, and their soft price of ~US$460 makes them even more desirable, turning them into something to possess. In Dutch we have a term for that, hebbeding; directly translated it would amount to thing-to-have, which says it all. Having a speaker is one thing. Looking at it is a second thing. Looking at it and liking what you see a third. And listening to it and liking what you hear a fourth, to paraphrase Vincent Vega. And for that reason I plonked the 750s onto Atacama SE-24 stands, and wired them to my temporarily system consisting of Marantz CD-17, my favourite integrated the PM-17, and the (IMHO) best budget turntable, the wacko Pro-Ject 6.1. Their sound is dynamic, quite detailed in the midrange and the treble, and with a reasonable amount of bass (although they go less deep and less tight as that wonderful small speaker the Quad 10L). Points of criticism are a sound stage that gels to the enclosures rather than being totally free and open, a certain lack of transparency, and some emphasis on the treble: a clear case of a commercial 'too-much-hifi' sound, but then, Mission is a commercial company! It doesn't sound overtly bright or harsh, but neither is it entirely clean and neutral. Another aspect that revealed itself when playing louder than usual (I don't like to bang head, see, I'm an ESL-owner) was that the Missions lose control and close-in at high levels. Finally, we played a bit with their setup. With spikes between speakers and stands the combination sounds a bit too fierce to my mild-mannered tastes, but with Foculpods dampers things fare considerably better. So, not the best sound around, but decent and listenable nevertheless. The question is: who would buy the 750s? The answer is not simple. Not the avid audiophile or music lover, to begin with, as the same money can buy better sounding speakers (someone mentioned B&W 602 or 603 to me, but I haven't heard either of them). Not the beginning home theater enthousiast, as the little Missions are, er, little. Not the casual mass-market hifi buyer, as the 750 seems to be quantitively not much speaker for the money. In the end, this product will go to buyers of life-style products, people who buy on looks alone, and perhaps to a small contingent of Sonus Faber-wannahave audiophiles. I wonder if that was what Mission intended?